Alexander Scourby was an accomplished Broadway Shakespearean actor, radio personality, movie actor, and narrator of many television documentaries. He was undoubtedly, best known for his eloquent voice. 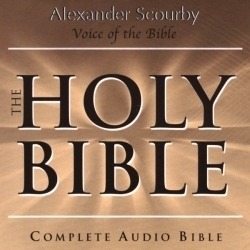 Scourby’s narration of the Bible has been recorded more than any other narration in the world. He will likely be best remembered for this recording of the Bible…one of his greatest lifelong achievements.